Update: This giveaway is now CLOSED! The winner is Carra (#2544). Congratulations! Thanks to everyone who entered! We love our Le Creuset French Oven! Not only is is pretty to display in our kitchen, but it is a dream to use too. It evenly distributes heat and locks in the optimal amount of moisture. The inside of the French Oven is sand colored enamel, which makes it easy to monitor food as it cooks, preventing burning and sticking. It is also easy to transport and clean. We love using our 7 1/4 QT. Round French Oven for making soups, stews, and chili. We can make a big pot to share with friends and family. The Iron Handle Skillet is equally awesome! It has a durable satin black interior enamel and brilliant exterior enamel. It is protected inside and out from chipping, cracking and excessive wear. The skillet is ideal for searing, frying, and even baking. We love making cornbread and Apple Cinnamon Crumble in our Iron Handle Skillet. Both pieces come in a variety of fun colors. We have the Caribbean color and LOVE it! The winner can choose whatever color they want! 1. Join Two Peas and Their Pod and Le Creuset on Facebook. Leave a separate comment letting us know you did so. 2. Follow @TwoPeasandPod and @LeCreuset on Twitter. Leave a separate comment letting us know you are following. 3. Subscribe to Two Peas and Their Pod. Leave a separate comment letting us know you subscribe via RSS. 4. Follow Two Peas and Their Pod on Pinterest. Leave a separate comment letting us know you follow. 5. Tweet the following statement about this giveaway. Enter to win a @LeCreuset Round French Oven & Cast Iron Skillet hosted by @TwoPeasandPod: http://bit.ly/XfcKU3. Leave a separate comment letting us know you tweeted. The giveaway is open until Monday, December 10th at 11:59 p.m. MST. The giveaway is only open to U.S. residents. Be sure a valid email address is included with your comment(s). Winner will be chosen randomly and announced on this post. We will email the winner and if the winner doesn’t respond in 48 hours, a new winner will be chosen. Good luck! Disclosure: This giveaway is being provided by Le Creuset, but our opinions are our own. I love the red! There’s something kind of old-fashioned about it. I also love the Caribbean color! It’s so fun! I like the orange flame and the red! I love the simple and classic white color. I follow both you and Le Creuset on FB. I follow your site by RSS feed. This morning, I’m leaning towards loving the Dijon color. It’s hard to pick. They’re all so beautiful. I love the Marseille blue color…gorgeous! I have your links in my RSS feed so I don’t Miss A Thing! I love the Flame (orange) color. I have several kitchen appliances and tools in that color and it would be a great addiction to have Nya first stock pot! I subscribe via Google Reader, too. I love the Flame and Carribean (oooh, together!!!) My Monday would get totally better if I won! Thanks for the chance Maria! I follow Two Peas on Pinterest! I really love the Carribean and Cassis colors! I have joined you both on Facebook! I follow both Two Peas and Their Pod and Le Creuset on Twitter. I love te red. So vibrant! That blue is beautiful – but I love a good orange too! I love the Caribbean color. What a happy smiley color to “makeover” my kitchen without the big expense! I love receiving your RSS feeds! I follow Two Peas and Their Pod on Pinterest! I follow both you & Le Creuset on FB. They’re products are amazing! I have a blue and want a green! I love the red/orange color. It would brighten up any kitchen! The Caribbean is definitely my favorite!! I love the cherry red color, to brighten up the kitchen! I love both the flame and the red. No kitchen is complete without Le Creuset in it! I love the Marsielles blue – it’s my favorite. I am a follower of all your boards on Pinterest! I subscribe to Two Peas and Their Pod via e-mail. I follow Two Peas & Lecreuset on Facebook. I love the RED! It makes me feel like I am a “hot, dinomite cook”!! I am a follower of both you and Le Creuset on FB! Followed on Pinterest…can’t believe I wasn’t already! I think I really like that blue that you have pictured! Thx for the chance – awesome giveaway!! Can I call pans beautiful? Well, I think they are!! I would love to win! I have followed you and Le Creuset on Facebook, subscribed via email, followed on Pinterest and now commenting for chances to win. I already subscribe to Two Peas and Their Pod. Love the colors. I subscribe to Two Peas via email. I foloow you on pinterest. I would really love this set! The Caribbean color would be a nice contrast to the rest of my kitchen. Would love to win. I love the Caribbean color but the purple/eggplant is my current favorite. My favorite color has to be Cherry, it’s beautiful. Although, all of Le Creuset’s colors are so vibrant I would be happy with any of them! 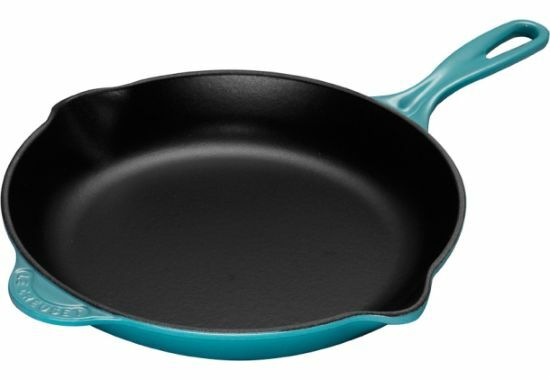 I have been looking for a heavy skillet to use on my cook top. These pots could be just what I need. I subscribe to Two Peas and Their Pod via Google Reader. I love the Auergine, Caribbean and Ocean, they definitely have some beautiful colors! I subscribe to twopeasandtheirpod via RSS! My favorite color is Ocean. ORANGE is smashing and would such fun to cook with for the holidays! Red is my favorite color and I have a couple of other pieces I’ve bought over the years and love them. Flame! The hotter the better! I have like Two Peas and Their Pod and LeCreuset on Facebook. I like Le Creuset’s basic white, and their pretty blues, and of course their classic red! I love the blue! But really any color would do! I follow you in my RSS feed. I absolutely love Cassis – it complements my black Dutch oven so well! I am following Two Peas and Their Pod and LeCreuset on Twitter. I subscribe to Two Peas and Their Pod. I love the red, but all the colors are so fun, it would be hard to choose! I LOVE that teal color in the post – it would go perfectly in my kitchen! I have followed both on Twitter! I follow you on Pinterest and love the red LeCreuset’s the best. LOVE this giveaway! I am a follower of Two Peas and now Le Creuset. Thanks for awesome prizes. I loved the Marseille color! I follow you via email!!! I’m a fan of the red. It’s bold and sassy! I follow Le Creuset on Twitter, too! The orange is so much fun- just love it. I subscribe via RSS feed!!! My favorite color is either the yellow or this Carribean blue! Love the dijon and indigo. This Caribbean blue color is amazing! I’d love to win some Le Creuset in this color. Wow! What a great giveaway. I’d have to say my fave is the blue, although I love all vibrant colors so the choice is a tough one. I subscribe to Two Peas RSS. A close tie between the Caribbean and chartreus-y green. So beautiful. Too many colors to choose from! I’d have to go with the Fennel green one. I follow you and Le Creuset on Twitter! I joined both of you on FB. My favorite color is red! Thanks! I like both of you n Facebook! I like Two Peas on Facebook. I am also following you on Twitter. Thanks! I subscribe to the blog via RSS. I love all the colors but especially Marseilles blue! I love the marseille blue! My favorite color is Flame! I subscribed via RSS on Google Reader. Oooh I love just about every color Le Creuset makes! However, if I would, I would pair Aubergine with Dune, as they seem to be a beautiful take on the classic black and white! Thanks for this chance to win!! I follow you and Le Creuset on Facebook! I subscribe to Two Peas by email. Great giveaway! Thanks. I would love to have it in red. But really, I would be happy with any color. I follow you on pinterest and am on your e-mail list. Love the peppermint cookie recipe you just posted. I am putting that one on my list of Christmas cookies to make this year. That robin’s egg blue is pretty great! I love them all! I have a few pieces in different colors (red, dark blue, Caribbean blue) and I’m think green or yellow next! I subscribe to Two Peas and Their Pod via email. I follow Two Peas and Their Pod on Pinterest. Most of my big appliances are red, so that would be my choice. I love following Two Peas and Their Pod on Facebook! That color you have here is gorgeous!! Love it! I now follow Le Creuset on Facebook! I think the flame is my favorite, but they are all so pretty! How do you pick just one color?! I say either cherry or indigo (but I reserve the right to change my mind!). I like the Orange Flame. I follow both you and Le Creuset on facebook! I subscribe to Two Peas and Their Pod and receive great emails!! I love Fennel. Such a beautiful green. I think the blue is my absolute favorite. I love the red, so classic! I love the La Creuset blue!! I subscribe to Two Peas and their pod! I just liked your on Facebook! Oh gosh, the red is gorgeous but my heart belongs to the Caribbean blue!! I like Two Peas and heir Pod and Le Creuset on Facebook! Following you and le creuset on FB! I love th flame color. Great giveaway! Aubergine or the Caribbean blue are the two colors I loooooove! It’s a toss-up between Caribbean and Flame. Favorite colors are difficult. Red for my Alma Mater? Caribbean to chase the winter blues away? Love, love the the Caribbean color. I follow you via RSS. I would probably have to go with Dune….not very adventurous am I, huh. I thought I loved the red, but the blue you have in this picture is better!! I am a cream/white gal all the way. Love their stuff! I joined Le Creuset on Facebook and already like Two Peas & Their Pod. I follow you and Le Creuset on twitter!! I love the Caribbean Blue color! So cheerful and fun! I follow you RSS. I would love the blue one. Thanks. Just followed you and Le Creuset on Twitter! I think I love the Caribbean color most, but my mood changes so often! Cherry, it’s such a bright color in the kitchen. My favorite colours are dune and Dijon! I love the blue-great giveaway! I definitely like you on Facebook! I just followed you on RSS. I really like the Dune color, then next came Dijon, then after I saw those two came their beautiful Fennel color but wait, I love the Ocean color, Aubergine, Indigo and Ink but I think my most favorite color is the Spinach!!! Yes, Spinach! yep.. Yes, creating a kitchen around cookware. I love the Caribbean color–it would match my new kitchen! Red is my personal favorite. I love the Marsellie color….gorgeous blue! Definitely Caribbean! I love that blue! I subscribe to Two Peas & Their Pod via RSS! I like Aubergine, but any would be great! I follow Two Peas & Their Pod on Twitter! I love the Caribbean color and I also love orange! My favorite is the red, followed closely by blue! I already follow you on FB and Twitter but I am now also following La Crueset on both FB and Twitter, as well. I am already a fan on Facebook & by email…..such a wonderful giveaway…i’d love any color!!!!!! The orange red color is my favorite! I am a regular follower, added to facebook, and pinterest, now. needed something like that. Thank you for all the inspiration, and help! I would love to put that deep pan to use for soup making!!! I love the blue bc that’s my favorie color! My favorite is the red, very classic. My mom is dying for one of these, it’d be a great Christmas gift! I love your website! I love the blue color shown on your website. I can think of so many things to do with these! Ink! I think all the colors are beautiful though. i love the turquoise! so pretty! My favorite Le Creuset color is the cassis. I subscribes to le creuset via Facebook, my favorite color is their “dune” color, I had hoped to get one as a wedding gift from registry, but did not, this would be a great addition! I follow you on RSS. I haved subscribed to Two peas ans their pod RSS! I like Two Peas and Le Creuset on FB. I’ve subscribed to the Two Peas RSS feed forever … love it! My favorite color is the Ocean that Williams-Sonoma carries and I love the Caribbean :-). I love the vibrant “Flame” color – it’s beautiful! I have been a fan of 2 peas and pod – great page and blog. I am a follower of LeCrueset and Ocean is “one” of my favorite colors. Liked Two Peas and their Pod on Facebook!!!!! Liked Le Creuset on Facebook!!!!! Followed Two Peas and Their Pod on Pinterest!!!!! Love the red, so bright and festive! Follow your blog on Google Reader, don’t know if that’s the same as the RSS feed???? I am following LeCrueset on Twitter. I am following 2peas on Twitter. I love the cherry or fennel color. My fav is the orange!! Love love! Love red, my kitchen is white, and everything is red and black. I liked two peas and their pod on fb. I have subscribed to 2peas through my yahoo.com . I’ve always wanted to own one if these! I think my favorite color would be the yellow. Holy Cow they have a lot of colors. I would have to say the Cherry is my favorite. Cherry, but would be estatic with any Le Creuset. It would make my day if I won this French oven! I am following (Maria) 2 peas on Pinterest. I follow you and Le Creuset on facebook! Love you both! I followed two peas and their pod on pinterest. I already subscribe to you via email! Flame! !…Although I’m not sure I’d choose it for our kitchen. Lovely giveaway! Is RSS email? I get your blog on email… And my birthday is the 19th… These pans would be a SUPER birthday gift! Cast iron can’t be beat!!! Caribbean! Even though it has a tropical name, it looks like something Donna Reed would have used in her kitchen. And who doesn’t want to be Donna Reed? i love the caribbean color also! following le creuset on twitter! My favorite color is the red!! Love it!!! I have tweeted the LeCrueset contest. I am a Facebook fan follow u under Erin Clifton Bennett!!! Following you on pinterest:) Fingers crossed for a win! Following you & Le Creuset on FB! I am a follower on Pinterest and I love the Red. I love all the colors with flame orange being one of my faves, but my kitchen accent color is blue and this Caribbean will perfectly match my old blue canning jars and picture frames!!! And on a side note, a cast iron skillet is on my Christmas list this year. Indeed one! I did tweet about this fabulous giveaway! Under @Goodlesnquilt! I Join Two Peas and Their Pod and Le Creuset on Facebook. Already following you on Pinterest! I follow on Rss also …. And love Pinterest yes! Under Godoodlesnquilt! Flame (red) if I was lucky enough to win. I love the cherry color the best! I love the orange and Caribbean! I follow Two Peas and Their Pod on Facebook. Caribbean blue without a doubt! I subscribe by RSS feed, Google Reader. Follow you and Le Creuset on facebook. I love. The red and blue. Omigosh, this is my favorite color! I’ve been eyeing these for a long time! Subscribe to two peas and their pod. Tore between the Orange and the Caribbean Blue. I love their orange color! They are all great – but red is my favorite. I love the blue!! It is my favorite color! I only have the red “cherry”, but would love to add a Carribean piece. It’s actually the blue posted above or red, just because it’s so classic. The color in your pictures! I love the Caribbean color! That was the color of my bedroom when I was growing up. So bright and vibrant! I suscribe to your RSS feed! My favorite color is the red. I love them all but especially the teal. My favorite color is orange – love your blog. I am now following two peas and their pod on Pinterest. My favorite color is Dune, with Ink coming in a close second. I love the classic white! I follow two peas and their pod on Pinterest :)! I like Two Peas and Their Pod and Le Creuset on Facebook. That Caribbean color is beautiful!! There are so many colors! I kind of like Marseille, which is like Caribbean but darker. My favorite Le Creuset color is flame. I subscribe to two peas and their pod via rss. What an awesome giveaway! I think I prefer the red one…. but really they are all beautiful!!! Thanks for the great giveaways!!!! I love the color red! It “spices” up my kitchen in the winter! I get the RSS feed & I am following you on pinterest. Love all your cookie recipes!!! I’ve joined Two Peas and Their Pod and Le Creuset on Facebook. Flame is a sharp color. I love love LOVE the Spinach color. I’m a sucker for anything green and when you combine it with cooking/baking? Total swoon-worthy. I love the INK color! Gorgeous! I follow TP&their pod on Pinterest. I love the red! So cheery! I’m a fan of both yours and Le Creuset on FB. And Ive been subscribed to your RSS for a while…love your site! My favorite Le Creuset color is Cherry. I love the Caribbean blue color! I joined Two Peas & Their Pod and Le Creuset on facebook! I follow you and LeCreuset on facebook. The aubergine and the spinach are beautiful! and name appropriate for the all the cooking I would do in them! The Caribbean color is lovely! I love the Caribbean! My mom had a set in flame when I was growing up- I love that we both have our signature colors! I love the dijon–and also the ocean! I subscribe via the email feed! I’m following Two Peas & Their Pod on Pinterest! I also like you and le creuset on facebook! I am a fan of Two Peas & Their Pod on FB. I am also a FB fan of Le Creuset. I already subscribe to you guys through my Google Reader. I’ve subscribed to Two Peas & Their Pod!! I’m following @LeCreuset on twitter! I’m following @twopeasandpod on twitter! I love the Spinach something about that green! I liked LaCreuset on FB! I have the blue color…but love the carribbean color! My favorite Le Creuset color is Indigo. I like Two Peas and Their Pod on FB! CASSIS or MARSEILLE are my favorite Le Creuset colors!!! Oh my goodness, I have wanted a Le Creuset French Oven for SO long!!! Thank you for the opportunity to enter this giveaway! SO generous! I love the Mediterranean color! Just lovely, and so pretty for presentation of my creations! I already like Two Peas and Their Pod on Facebook! I follow Two Peas and Their Pod and Le Creuset on Facebook. All of them! But orange the most, to match my kitchen. I also already like Le Creuset on Facebook! Glad I receive your emails. My favorite color is fennel, although flame is a close second! I receive emails from Two peas and their Pod !! BTW Lovin the recipes! I follow Two Peas and Their Pod and Le Creuset on Twitter. I not only “like” you on Facebook, I LOVE you! I already suscribe to Two Peas and their Pod via RSS, too! I follow Two Peas and Their Pod on Pinterest!! I own one in the grey which i love- but i also really love the turquoise color! I subscribe to Two Peas and Their Pod via RSS. I’m following you both on twitter. I love the blues, oranges, and purples!!! I like both of you on FB…. I’m a red girl all the way! Anything BLUE is my favorite! And now I’m following on Pinterest too! I love cherry and ocean! I don’t think the French oven comes in it, but I love Truffle! I subscribe to RSS via My Yahoo! I also am an email subscriber! I <3 <3 <3 the blue!!! Love the blue color shown!! I follow you on Pinterest too! You guys are great! 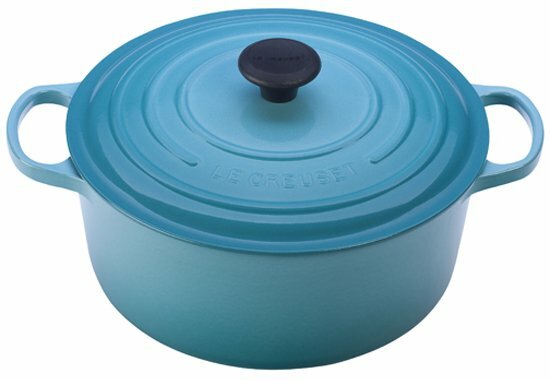 I love the Caribbean blue le creuset–my 2nd favorite color is the fennel green! I’ve liked La Creuset on Facebook – and have been a “friend” of Two Peas & Their Pod for “ages”. I love the Caribbean and Flame! I like you and Le Creuset on FB. I follow you and Le Creuset on Twitter. My only le creuset is a yellow tea kettle which is one of my prize possessions. It’s sunny color greets me when I walk in the kitchen. Its taken me a few minutes to review all the colors and am madly “in love” with the red – it just POPS. I’ve never been able to buy any of these incredible pots – being retired and on a very fixed income, I never thought I could own one – never mind TWO and in my favorite kitchen color, RED. I can imagine making chicken and dumplings in the French Oven AND making cornbread in the skillet to go with with home made chili simmering in my French Oven. Hoping that you make a little old lady happy this holiday season. We are tweet-buddies on Two Peas & Their Pod. LOL – my daughter had to explain what it was and now I’m hooked. I love the Caribbean color, oh and the orange too! 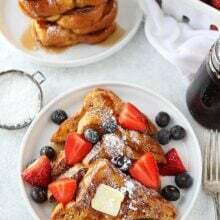 Following on Twitter – Le Creuset – the recipes are incredible – makes my mouth water just thinking about using these two pieces. I ‘liked’ Le Creuset on facebook. I already ‘liked’ Two Peas and Their Pod on facebook. I love them all. Who can decide a favorite. They are all beautiful. Cherry and Indigo are my favorites! Cassis is the color for my kitchen! I love this blue one! Following Two Peas & Their Pod on Twitter. 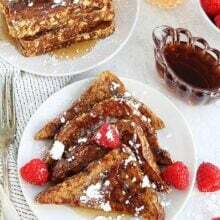 Great blog and their recipes and crafts are to so welcomed at this time of year! I follow Two Peas and Their Pod in Pinterest. So many colors to love but I’m partial to the turquoise blue. Following Two Peas and Their Pod on Pinterest. Great giveaway!! I’ve been searching the stores for these, and they always get snatched whenever there’s a sale. All of the colors are beautiful but the green and yellow ones are happy and cheerful! I have yellow and royal blue pieces but this turquoise is gorgeous! Maybe my new favorite!! and finally, I also follow on pinterest! I love, love, love the teal color. But really I think all the colors are beautiful. I have wanted a le-creuset skillet for so long, but just can’t afford it now. Thank you for your consideration. Already subscribed to Two Peas & Their Pod for emails. Enjoy their blog so much! I love the orange! So cheery. I love the marseille, it is my favorite color. I love all of the bright colors but most of my pops of color in my kitchen are red so I’d have to say Cherry. I love love the Ink color. I love both Carribean and Fennel. I would go with the one pictured, its gorgeous! I subscribe to two peas in their pod. I LOVE the Cassis purple color! But The cobalt blue and dijon yellow are also favorites. I follow Two Peas via RSS feed. I love all of the colors, but the red ones are my favorite! I love Flame (orange)! I have a Dutch oven in flame and I adore it!! My original favorite Le Creuset color has always been Cobalt, but more recently I’ve added Fennel and Caribbean Blue to the mix. Love them! I absolutely love the red! I am drawn to the darker colors – cherry or indigo. But the cassis would be a fun color too! I love the black, but it is so hard to find, so my second favorite is the caribbean blue! I love the Caribbean color! I am also a Pinterest follower. I follow Le Creuset on FB! I like Two Peas and Their Pod and Le Creuset on Facebook! I’m not sure what my favorite color is since I’ve never had one but the Dune looks like a good color to start with! My favorite color is the red! I follow two peas and le creuset on twitter! I follow @TwoPeasandPod and @LeCreuset on Twitter! I like Two Peas and their Pod and Le Creuset on FB! I subscribe via RSS with google reader! i like you both on fbook! So hard to choose. I love cassis, but I’m also loving the green colors – fennel, spinach, kiwi. So great! I follow you and Le Creuset on FB! My favorite Le Creuset color is red, but I also love this Caribbean blue! If I won I would pick the color flame(orange) 🙂 I also like the color Cassis(purple) but they are all beautiful! I am red crazy for all my small appliances! 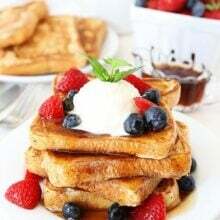 I think they make the food look so spectacular! I like Two Peas & Their Pod and LeCreuset on FB!!! My favorite is definitely the bright green kiwi that is being discontinued. However, cassis is a close second! Well, purple is my favorite color so I’d be tempted to go with Cassis for Le Creuset color, but since it just wouldn’t go in my kitchen, either the cherry or the fennel would be my next pick, in that order. My husband and I love to cook in cast iron. Thanks for providing the opportunity to win one of these. I already follow Two Peas and LeCreuset on Facebook! I like any of their shades of blue. I tweeted! Thanks for an awesome giveaway! This is my color and I love Le Creuset! Happy Holidays.